Good news has finally come for an Edinburgh schoolgirl struck by cancer three times. Kira Noble's case caught the imagination of her local community when her parents decided the best chance of beating her aggressive neuroblastoma was to travel to the US for treatment. School friends, family and strangers managed to raise £350,000 in just three weeks for the life-saving surgery. Now her mum Aud has revealed the 14-year-old's tumour is gone. In a social media post, Aud revealed: "A post op meeting with our New York surgeon took place at 18:45 here and confirmed that all her tumour was taken out successfully after 6.75 hours of surgery. "A follow-up scan will take place to clarify this news and more treatment will be put in place to deal with any remaining microscopic cells that could be hanging around. "I cannot describe my feelings as being relieved - it's more a case of I believed in this all along. I believed in the skills of this surgeon and felt confident in his unsurpassable skills in resecting challenging tumours." The Noble family faced a race against time to raise enough money to pay for Kira's lifesaving cancer treatment. She was booked in for surgery at the Memorial Sloan Kettering Cancer Centre in New York, with only hope filling the family's bank account. A Herculean effort saw Kira supporters smash through the £350,000 total to pay for the US trip. Kira was first diagnosed with neuroblastoma in 2014 when she was 11. She has had three major abdominal surgeries in Scotland in addition to her fourth in the US. 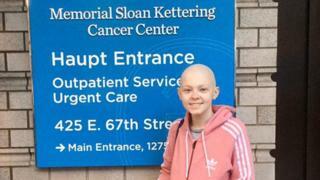 Before she left on the New York journey she had just completed her 19th round of chemotherapy. Aud is praying that this is the start of a new life for her daughter. She told BBC Scotland News website: "I had every confidence in the unsurpassable and specialised skills of our New York surgeon to fully remove this tumour, which was wrapped around major blood vessels. "That was why we chose him. "We can't thank the amazing public enough for what they did to help us raise crucial funds to make this possible." Kira even managed to get up an move about on Thursday and hasmoved out of intensive care to a general ward. Kira is delighted with the results of the operation and told the BBC: "I tried not to get my hopes up in case the surgery was too difficult. I was really happy to learn that my New York surgeon got it out. "